When Shaun Dodge, a producer for ESPN radio (and a former Carolina Crown bass drummer) heard last fall that the Dallas Mavericks were looking to audition people for a drum line (similar to the Denver Broncos' Stampede drum lime), he leaped into action. Dodge, who is also a member of Surround Sound Percussion (a WGI line from Ft. Worth, Texas, that competes in the PIO category), quickly contacted his Surround Sound linemates and amassed a six-person percussion group. "Shaun saw the post on the Mavericks website called the staff and got the ball rolling from there," elaborated drum line member Brandon White. Then Dodge called the Mavericks and said, "Hey, we can save you the trouble of having to filter through all those r?©sum?©s and put a program together with six new people. We already have a group of six people and can have a complete program put together within two days," according to Dallas Mavericks' Drumline member Tony King (a bass drummer with the Blue Knights in 1997, 1998, 2000 and 2001 – he was also the I & E bass drum champ in 2000 and 2001). King continued, "They liked what we told them, so they told us to put our program together and come play at the first pre-season game in three days as our audition. They liked what they heard, enjoyed our energy, and got positive crowd response. The rest is history!" The group began rehearsing and cleaning on Sundays during the season. About every two months now, the group learns new music and cleans at an extra rehearsal. "Practice? What's that?" quipped White. "Everyone in the group has full-time jobs, plus the rehearsal schedule for the indoor drum line, so practice time is pretty slim." Other members of the Dallas Mavericks' Drumline include Phantom Regiment and Crossmen alum Brandon White, Velvet Knights and Sky Ryders alum Keith Stephens, Revolution tech Michael Littlejohn and Carolina Crown alum Vincent Mendoza. The instrumentation includes three snares, one quad, and four basses on stands with two people playing them, King said. 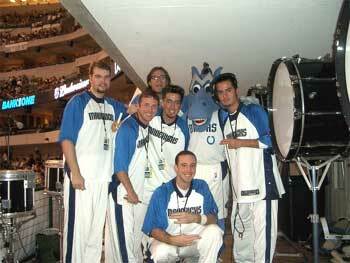 The group performs at the Mavericks' 45 home games, or about two or three per week. They get to American Airlines Center approximately two hours before each game to "set up, do sound check, and practice -- not to mention eat a HUGE meal before every game," King said. The drum line's repertoire consists of basic cheers and more complicated features. "When the season first started, we had a lot of basic and easy chants we played such as "Defense," "Let's Go Mavs, Lets Go," the "Mars" lick. We also had three individual tunes that lasted anywhere from 30 seconds to 1 minute and 30 seconds. We used these tunes when they would feature us and the others during game play," King said. "Since then, we have a total of 12 loops that we play when they call for us to play on offense. We only play the "Defense" chant when the call for us to play on defense. We also now have a total of eight longer tunes to choose from when they feature us during a time out. Some of the things we play are taken from popular groups such as Outkast, Roots, Snoop -- things that would sound well and come across with just a drum line playing," King said. "We have received a lot of positive feedback from the crowd!" King said of the fan reaction. "We always get compliments from people as they leave the game saying how much they enjoyed our contribution. CBS did a local story on us a few months ago as the new edition to the Mavericks entertainment. Every three or four games, we will have somebody come by during or after the game who has marched DCI before. There's always some great conversation when we find that out. It's an instant bond for those us of that have experienced DCI," King said. White agreed that the crowd response has been tremendous. "The crowd loves us. We could use a little more of the female fan support if you know what I mean, but the response has been tremendous. I don't think even the marketing staff that set us up knew how big this would become," White said. King said that some usual fan support comes from an unusual source. "We also get a good amount of drunk guys who come by and say, "Hey! Let me beat on those things!" We usually reply by saying, "Can't let you do that chief, but I tell you what -- you can stand there and cheer for us." Now that the NBA season is winding down, King said he and the other members will miss the action in the off-season. "We love being a part of the game, and nobody has grown tired of it yet. In fact, we will miss the season when it is over soon." White also said the drum line will continue to help out the Mavericks through the end of the season. "We are looking forward to helping support the Mavs into and through the playoffs as well as continuing the line in the future."